Community facing a protracted, draught-induced famine? Family struggling to subsist on one meal a day? Forced to drop out of school because your parents can’t afford the $80/year school fees? That’s what William Kamkwamba did at the age of fourteen. After surviving a five-month famine, Kamkwamba was determined to find a solution. Inspired by a picture on the cover of a library book, Kamkwamba built a windmill out of trash and scrap metal–even though he had barely any resources, his community ridiculed him as a crazy man, and there wasn’t even a word for “windmill” in his language. His windmill brought electricity to his village and powered an electric pump, allowing his family to consistently irrigate their fields and squeeze and extra growing season—and an extra harvest—in every year. 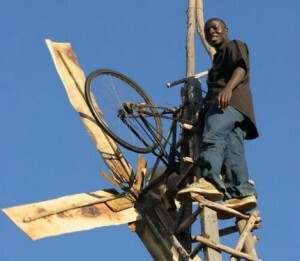 What makes Kamkwamba’s story so exciting is how he figured out his windmill totally by himself. But I wish we all learned in school how to make sustainable energy sources out of trash! On the other hand, I wonder if Kamkwamba would have built his incredible windmill if he hadn’t had to drop out of school. It seems like that period of “empty time” really gave him space and drive to explore his dream. That said, I am thrilled that Kamkwamba is now getting an awesome education at the African Leadership Academy, a pan-African high school in Johannesburg. You can read all about Kamkwamba’s truly awesome triumph of persistence, determination, and self-education in his book, The Boy Who Harnessed The Wind. Also, Kamkawamba has a great sense of humor that doesn’t always come across on the printed page. You can get a little taste of how funny he is in this clip where Jon Stewart interviewed him on the Daily Show.